"How does knowing who it is help me not die?" Screen Media Films has debuted the full trailer for an indie horror comedy titled You Might Be the Killer, which premiered at Fantastic Fest and Toronto After Dark earlier this fall. This "hidden festival gem" is a meta horror about a camp counselor, played by Fran Kranz (from the other meta horror The Cabin in the Woods), who blacks out and wakes up with bodies all around him. He reaches out to his friend, a slasher movie expert, to help him survive the night only to discover he might be the killer after all! What a fun concept, and as long as it's as good as it sounds, this should be a nice horror treat. The film also stars Alyson Hannigan and Brittany S. Hall. Looks like a bloody good time. A camp counselor (Fran Kranz) suffering from blackouts finds himself surrounded by murder victims. He turns to his horror movie enthusiast friend for advice, and to contend with the idea he may be the killer. You Might Be the Killer is directed by American filmmaker Brett Simmons, director of numerous indies including Unsung Heroes, Mark of Love, Husk, The Monkey's Paw, Animal, and Chilling Visions: 5 States of Fear previously, as well as a few short films. The screenplay is written by Covis Berzoyne, Brett Simmons, and Thomas P. Vitale. This premiered at Fantastic Fest and the Toronto After Dark Film Festival this year. 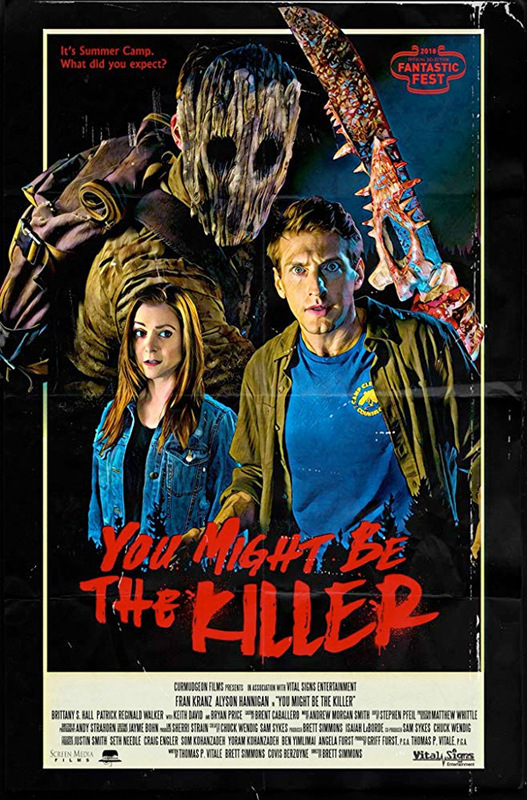 Screen Media debuts Simmons' You Might Be the Killer direct-to-VOD starting December 4th this month.